I have been home for about 10 days since Nicaragua and I have to admit it's been a rough landing! I am finally almost feeling back in the groove of life. So glad I had a few photo sessions this week with such great people to kick my off the couch and help me get back in business! The first one was last Saturday and a small low key fun loving Wisconsin Wedding. It was a great way to kick off the wedding season. It's still being edited, but you know a blog about it is coming. And the other session to get me back in the groove was a sweet engagement session. This couple is one I have really enjoyed getting to know. They were engaged perhaps around Christmas. Stefanie is a girl I had the privilege of meeting around October last year. She is a massage therapist at Point Family Wellness and needed a head shot. She came in then and shared that she had hopes of getting engaged soon and now she is! Since then we became friends on facebook and she is easy to chat with online. It has been fun to get to know her and watch the entire process unfold. Shortly after the engagement they bought a new house out of town a little ways. She shared photos on facebook of their new home showing this cool barn board wall in the basement. The perfect photo background. 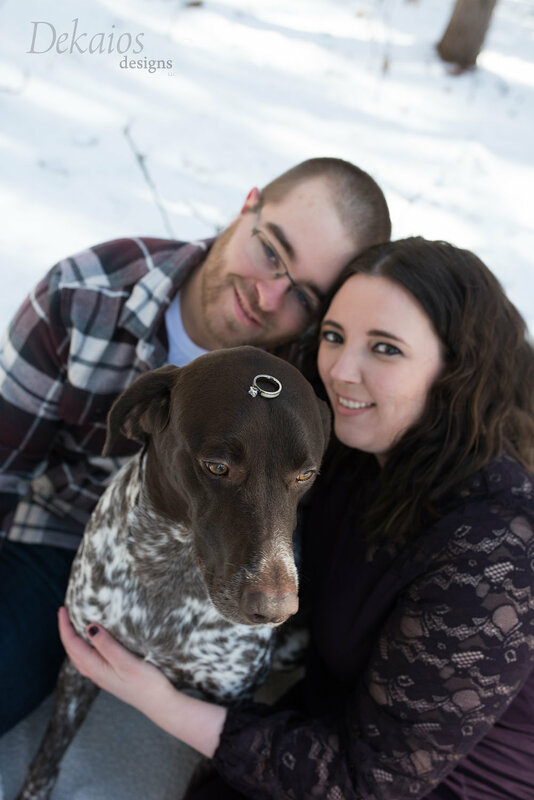 So for their session I drove out there and we had fun with their sweet dog, cool new house, and them as a cute couple. I think they will be easy to photograph on their wedding day. As I have shared before, part of the fun of an engagement session is getting to know each other a little bit and getting used to being in front of the lens. We accomplished all of this during our session. The barn board wall in the basement. And their sweet smiles. Some random puppy love fun and the ring of course. 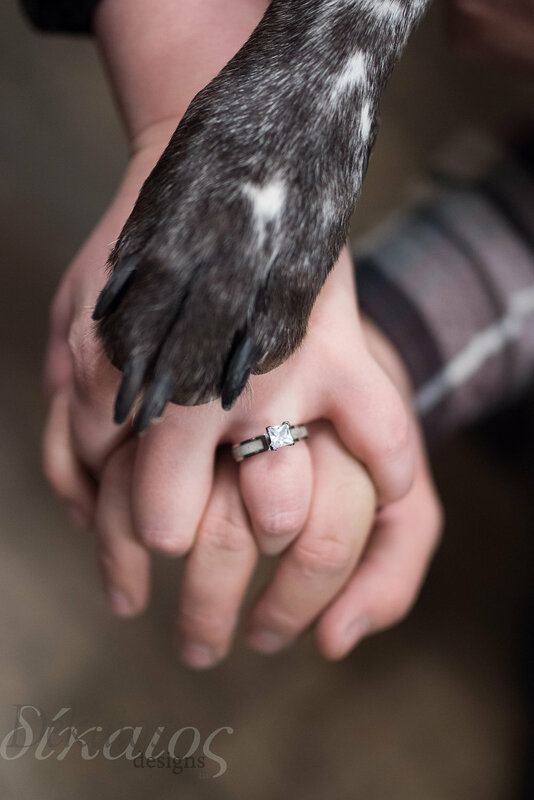 Stefanie made a sign for her pup to announce their engagement. Love the trees and sun sparkles in the background.